I bought a '23 chassis last year and finally got around to taking it apart. 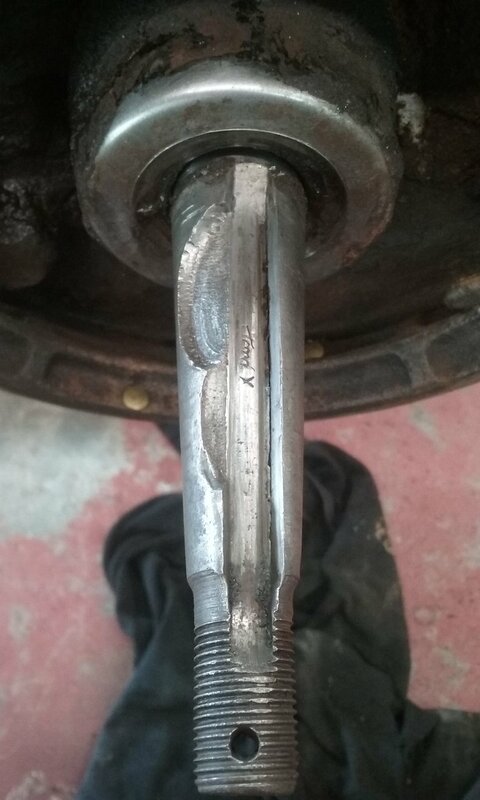 As I took the rear axle nuts off I was happy to see perfect threads and no signs of someone with a big hammer. After removing the wheel, disappointment soon took over as I found the keyway obliterated. This is going to take a good layer of high strength JB weld to fix this ! and yes I am just kidding. The big chunk fell out when I pulled the wheel, so yes it was put back in service with the small piece missing. The worst part is I took this apart hoping to find a good axle to repair another rear end. I still got nothing. What color would work best ? Ultra Black, of course ! My original idea was high temp orange, ya know... just incase the brakes got hot. Then I got to thinkin... would red make it go faster??? GORILLA GLUE! and of course some duct tape as required. Just cut another key way. What could it hurt. I like John's idea, turn it 180, cut a new keyway, use one of those shims to cover the sin on the other side, good for another 90 years ! I'm going to stay away from the RTV, it is always a mess to clean up next time it's apart. I would be suspicious that there are stress risers in the end of that axle, if not actual cracks, so that I would be very leery of cutting a new key-way and using it. Darryl, beware of some of the replies. They are not real. All you need to do is swap that axle to the other side of the diff housing. That way the torque delivered by the driveshaft will be driving the rear wheels, with the good side of the keyway taking all the power. Hehehe, This is a funny thread. But straight up I had a golf cart axle and hub that had done exactly the same thing years ago. I "squirted some mig on it" and used die grinders and dremel tools until I got the key way and stuff right and it ran for years. But when it did let go again, there was no fixing it and it took out hub and all,because I had also done the same thing inside the hub to repair it's keyway. The repair would have held for much longer had I simply kept a check on cotter pins and so forth. 140 dollar lesson learned that day. Maybe a whole tube of green loctite, then tighten the hell out of the axle nut. It does have really nice threads! Guys, that keyway is pooched beyond fixing it with glue. At this point you have to at least drill through the hub and axle so you can pin it. This shaft is not beyond salvage. At the Railcar Company where I worked for 37 years, it was located at an old 125 year old ACL RR locomotive repair facility that had a lot of very old equipment of which parts were no longer made nor available, so whenever something broke or wore out, it had to be repaired or made. Luckily, we had some very talented welders and machinists that we�re up to the challenge. Tim, my drill press vice isn't large enough to hold the rear axle assembly and drill a pin hole true enough for a roll pin. Good idea though! Jim, I am sure it could be repaired, but if I cant come up with a good used axle, a new one is only $100. That may be the route I go, as I had hoped this rear would supply parts to repair the one in my '25. I now have two rear ends, no usable axles. I do have four real nice pry bars now though! the axles are 1/16 th thicker than regulation horse shoe stobs so maby your players won't notice. The keyway appears to have a crack in it so you can't even cut a new keyway 180 degrees opposite. But you could weld it up for a doodlebug tractor, or some kind of stationary equipment. Not really for a road car. This is what happens when you go drag racing with your Model T. It knocks the keyways out. Should have never installed that high lift cam and jackrabbit clutch !